Madhvacharya is the principal acharya, or spiritual teacher, in the Brahma-sampradaya, the Vaishnava disciplic line from which the Gaudiya sampradaya descends. He was born in Udupi, South India, in the early thirteenth century. At the age of five he took initiation and at the age of twelve left home to take sannyasa (the renounced order of life). 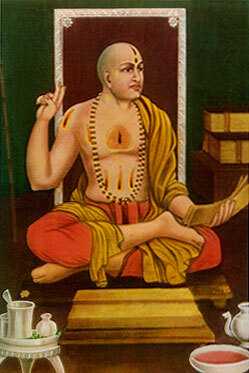 Madhvacharya studied the Vedas under Vyasadeva, the compiler of the Vedas, in the Himalayas. Madhvacharya's Vedanta-sutra commentary, Purnaprajna-bhasya, establishes the doctrine known as Suddha-dvaita-vada ("pure dualism," meaning God is distinct from His creations). Madhva used his erudite scholarship to crush the Mayavada (impersonalistic) philosophy and establish devotional service to the Supreme Personality of Godhead.